Home Life The Frisbee — Why didn’t I think of that? The Frisbee — Why didn’t I think of that? I was never really terribly impressed by the hula-hoop. Magic Sand held my interest for about 15 minutes. Slip ‘N Slide was painful. And though I spent countless hours playing ultimate frisbee in university, I never could throw a frisbee very accurately. I guess I was just more of a yo-yo fan — and those were manufactured by a completely different company. Last week, Richard Knerr passed away. He didn’t invent the Frisbee, or even the Hula Hoop, but he did make a successful business around them. Richard Knerr, co-founder of the toy company that popularized the Hula Hoop, Frisbee and other fads that became classics, has died. He was 82. Knerr, who started Wham-O in 1948 with his childhood friend Arthur “Spud” Melin, died Monday at Methodist Hospital after suffering a stroke earlier in the day at his Arcadia home, his wife Dorothy told the Los Angeles Times. Knerr and Melin, who died in 2002, got their start in business peddling slingshots. 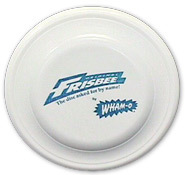 They named their enterprise Wham-O after the sound a slingshot made when it hit its target. They branched into other sporting goods, including boomerangs and crossbows, then added toys such as the Superball, Slip ‘N Slide and Silly String. When a friend told them in 1958 about a large ring used for exercise in Australia, they devised their own version and called it the Hula Hoop. Around the same time, they bought the rights to a plastic flying disc invented by Walter “Fred” Morrison, and renamed it the Frisbee. Anyway, as I’m slowly but surely dissolving my own company, I’ve come to realize that I made a critical mistake when I started. Originally I’d planned to start my own ISP — and I even had the backing to do it. At the time, AOL was the market standard and they had a lot of critics — basically they were easy prey on a small scale. I think I easily could have started a small and local dial-up service out of my parents home. That never materialized because I didn’t really pursue it aggressively. What I did pursue was web design. That lead to generic graphic design for logos and things, and eventually I even took up photography too. I think I did alright. I’d consider myself a pro across all three lines of work. The photography was easily the most profitable, but it also had the highest start-up costs and without a contracted job, it would have been an impossible climb to profitability. Freelance photography just isn’t profitable these days and that’s where I find myself these days. The problem was that all three required, well, me. And that’s where I screwed up. I went into a business that would essentially *always* require me on the frontlines. Knerr and Melin did it the right way with Wham-O. They came up with an idea, financed the initial start-up costs to manufacture and market the product and then sat back and managed while low wage employees did all of the actual work. They were able to step back and just reap the benefits. The fields I chose weren’t something that I could ever pass off to a low wage employee. And that was my big mistake. Some call it “passive income”. I’m not sure that’s what I had in mind. Sure I’d like to open a coin-op laundromat or car wash that requires very little maintenance, but I don’t know that 1, those are very profitable or 2, that they’d hold my interest. If I could do it all over again, one thing that has always come to mind is an ice rink facility. The upfront costs would be huge, and I’d imagine the utility bill would be sizeable too, but once it’s up and running, all you’d need is a couple of part-time Zamboni drivers, a manager of some sort, and local kids earning minimum wage to serve as skating guards and referees — then when profits allow, expand into offering skating lessons with paid instructors. I’d enjoy it just as much, and now, after 11 years, I’d probably be making more, and working less, than I am now. I agree with the principles completely. I feel the same way about blogging. Yes, it is great, yes you can make money, but ultimately if you don’t put in the time the business fails. Unlike things like writing a book or software were you capture a piece of yourself or talent for reuse resale. Those are generally larger one time investments that continually pay. The later sounds wonderful, even if only as a supplement to things you are doing daily that you love and earn money at.